How far in advance do I need to book dog walks? If you know the days you will need walks, please let us know in advance. However, we understand that things come up and you may need a walk last minute, and we can cover that, too. It is best if you can give us at least 24 hours notice so we can get you on the next day’s schedule. We can usually accommodate same day requests, but during our busiest times (holidays & weekends) we may run short on availability. If you think you might need a dog walk, but you are not sure, go ahead and give us a heads up and we will add a tentative visit to our schedule so you are sure to be covered. What is your cancellation policy for dog walks? Our dog walking cancellation policy is very flexible. If you need to cancel a visit, we will just add it as a credit for any future visits that you book. This way you can have flexibility in scheduling while not being out any cash when your schedule changes. What time can you come for a dog walk? Our walkers come during designated time slots. Although we cannot guarantee a specific time, we can shoot for a preferred time when it is requested. Please ask about our pet sitting if you need visits outside of these times. You can read you can read more about visit times here. Can you walk dogs who have health problems or medical concerns? Of course, we are happy to help! We hire great people that are great with all types of pets. We are very careful not to push dogs that have health concerns, and we go at their pace. We are always on the lookout for changes in a pet’s health and we will let you know right away if we see anything concerning. Yes, we can administer all medications. Do you walk in the rain or snow? Yes. In more extreme weather we will shorten the walk and do indoor playtime instead. Can you walk dog reactive dogs? Yes, we work with dog reactive dogs on a regular basis. We are trained in best practices for handling dogs of all types. We can even continue your clicker work if you are working on a training program. Can we do a mix of playtime and a walk? Yes, we can customize visits to best suit your needs. What do you do while out on a walk? We can customize visits as you like. We view dog walks as a time for your dog to simply be a dog, de-stress, explore their neighborhood, get exercise, and get fresh air. The time is for your dog, and our goal is to make sure your dog is super happy! Can you do an off-leash walk? We cannot do any off-leash walks in Fort Collins because it is against city code. Fort Collins dog parks and Loveland dog parks are available for off-leash time, when requested. Can you take my dog on a car ride to a park? Yes, we love going to nearby parks. We simply consider the car ride as part of the dog’s walk. Can you walk people reactive dogs? How much do dog walks cost? On days that are very hot or very cold, we will shorten walks by one third. The remainder of time is spent doing indoor playtime. Do you have a leash and harness that you prefer and/or recommend? We will walk with any leash and harness that is safe. If your dog is a puller, we recommend the Pet Safe Easy Walk harness. Yes, we have specialized insurance – specific to pet sitting & dog walking. “Setting up The Door” For Dogs – We also “set up the door” in a way that simulates how your dog will react when we come to your house while you’re away. It’s really easy- we’ll all go outside for a couple of minutes, then your sitter(s) will go inside to meet the dogs by themselves. As long as your dog reacts well and lets us get near them/pet them/put a leash on, we know we are good-to-go for your visits. How can I schedule visits? Once you are set up in our system, you can request visits through our online system. For your first set of visits, you can contact us by phone or through e-mail. Friends, neighbors, cleaners, etc. will be in my home while I’m away - should I let you know? Yes, please let us know if someone will be in the house during the visits. Running into an unexpected stranger makes our heart skip a beat! We don’t mind if someone is in the home between scheduled visits. When will I get updates from my sitter? Your sitter will send a message from every visit. Your message will include a bit about what we did at the visit, as well as pictures from that visit. We generally send 2-6 pictures per visit. We will give you a call if we have any questions. Do you have a backup sitters? Yes, we have a full team with part-time staff and backup sitters. We provide a heavy-duty lockbox at the meet & greet. Using a lockbox keeps you in control of your key. The lockbox is yours to keep. We can also keep keys on file. All keys are coded, so only your sitter can match your key to your house. When keys are not in service they are stored safely. Do you offer phone or text customer support while I'm away? Yes, call anytime. We offer as much phone support as you like while your pets are in our care. Do I get to keep my lockbox? Yes, the lockbox is included with your service. It is yours to keep. We offer pet sitting visits starting at 7:00am and as late as 9:00pm, every day of the week. Our office hours are from 9:00am to 7:00pm, every day of the week. While your pets are in our care, you have unlimited phone support. We have a minimum fee of $100. If you only need a couple of visits for your first booking, we can keep your remaining balance as a credit in our system. That credit can be used for any future visits within one year. Will I be able to meet my sitter before we leave town? Yes, we always set up a meet & greet so you can make sure everything is a good fit. We want you to feel comfortable with our service and we want you to know that your pets are in good hands. We have a standard application process that we use to screen people out. We have a hiring manager that conducts phone interviews for further applicant screening. Then we do an in-person interview, generally at the dog park. Next we check references, and finally a background check. Every new member is brought on for a 90-day probationary period, where we can continue to evaluate them. 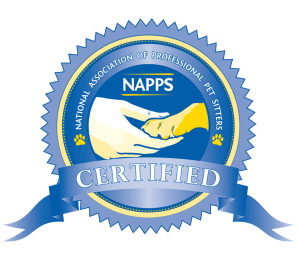 We train our sitters on our written procedures, and we complete 15-20 shadow visits together to make sure the sitter is doing everything according to the Paws At Home process. By this time, we have a pretty good idea if the sitter will be a good fit. What extra fees might I encounter? Visits outside of Fort Collins are quoted individually for a travel fee. Visits that consistently take longer than scheduled time – $7 for each extra 15 minutes needed. We charge $35/hour to pick up pet supplies, pet food, etc. We will also charge for the cost of supplies. Emergency medical care – in the rare case that this is needed, you are responsible for all medical charges, and time spent at a rate of $35/hour. Your sitter will contact you as soon as possible if anything out of the ordinary happens. First time hiring a pet sitter? Check out our blog for answers to your questions! We are always happy to help. Give us a call and we can customize a package for you. We are always checking our email. This a a great way to get in touch with us.